As much as it is important to shop for the right foods, it is also important that we cook them the right way to stay healthy. The health benefits of the healthiest foods are easily killed if cooked the wrong way. Did you know that heat breaks down and destroys 15 to 20 percent of vitamin C, folate and potassium present in vegetables? But certain foods like carrots, spinach and tomatoes actually benefit from cooking. Heating these vegetables facilitates the release of antioxidants from the food to the body. Too technical isn’t it. Simply put the ideal way to cook right and be healthy is to use less oil, cook slow and grill or bake (whenever possible) to retain all its nutrients and goodness. In our household it’s mostly done on the flame rather than the oven. But of late I have been reading too much about the health hazards of cooking in non-stick cookware. Non-stick pots and pans are metal pans (such as aluminum pans) coated with a synthetic polymer called polytetrafluoroetheylene (PTFE), commonly known as Teflon. When used at high temperatures toxic fumes from Teflon causes flu-like symptoms and is extremely harmful to us. Apart from the health concern I was also annoyed with scratching and chipping of the utensils (especially when handled by maids). So I looked for a cookware range that offered the same non stick capabilities as Teflon, without dangers of exposure to PTFE (Polytetrafluoroethylene). That’s when I came across the hard-anodized range from Vinod Cookware. These are slightly heavier than the non-stick range but like aluminum pans heat up quickly and evenly. They are also sturdy like stainless steel cookware and can handle metal utensils without scratching, cracking or chipping. What I also liked about the cookware is the fact that it’s non-porous, meaning it doesn’t absorb smells from the food that has been cooked in it. So I can clean and use the pan I cook fish in to make pasta without the pasta reeking of fish! The aftercare is pretty straightforward. Abrasive pads or metal sponges can be used for burnt-on messes or tough stains – the surface is durable enough to withstand even harsh scrubbing! So if you are in the market for new cookware for yourself, warming gift or wedding gift and you are trying to decide on hard anodized cookware vs. non-stick cookware, I would suggest go for the former from Vinod Cookware. Apart from being cost effective they are exceptionally durable and tough enough to stand up to the rigors of a busy kitchen. 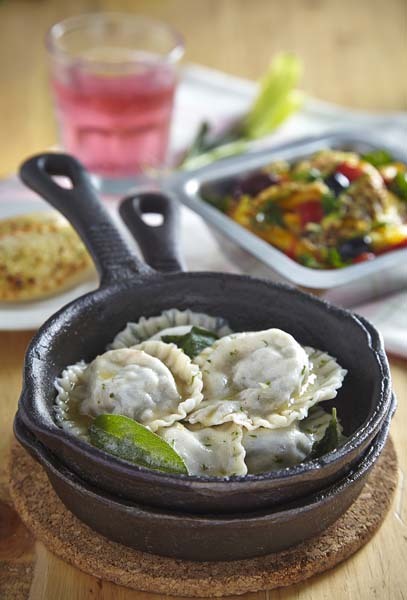 Talking of cookware has anyone tried the new thermo range of cookware that cooks without oil or water?